Orbital welding first found use in the 1960's when the aerospace industry recognized the need for a superior joining technique for aircraft hydrolic lines. The solution: a mechanism to rotate a welding arc from a tungsten electrode around a tube-weld joint. Regulating weld current with a control system automated the entire process. The result was a more precise, reliable method than manual welding. A series of enclosed orbital-weld heads, like the one seen here, join tubing 1/16 to 6 inches in diameter with wall thickness to 0.15 inch. For welding larger-diameter and thicker-wall tube, fabricators opt for open-style weld heads. Orbital welding became practical for many industries in the early 1980's with the development of portable combination power supply/control systems that operated from 110-V AC. Modern orbital welding systems offer computer controls that store welding schedules in memory. The skills of a certified welder are thus built into the system, enabling the production of enormous numbers of identical welds and leaving little room for error or defects. For orbital welding in many precision or high purity applications, the base material, tube diameter(s), weld joint and part fit-up requirements, shielding-gas type and purity, arc length, and tungsten-electrode type, tip geometry, and surface condition may already be written into a specification covering the specific application. In addition, orbital-welding equipment suppliers can offer recommendations on equipment setup and use. For those applications where no specificaton exists, the engineer responsible for welding must create the welding setup and develop the welding procedures. In general, the commonly used 300-series stainless steels offer a high degree of weldability using orbital equipment except for Types 303/303SE, which contain additives for ease of machining. The 400-series stainless steels, while generally weldable, may require post-weld heat treatment. Fabricators should be prepared to adjust the orbital-welding setup to accommodate for potential differences among material heats. The chemical composition of each heat will vary in the concentration of alloying and trace elements, which can affect conductivity and melting characteristics. Minor deviations in elements such as sulfur can affect fluid flow in the weld pool, completely changing the weld profile, while also potentially causing arc wander. When welding on a material from a new heat number, the fabricator should weld a test coupon for the new heat--he may need to make minor changes in amperage to generate the required weld profile. 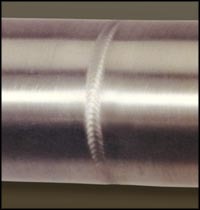 A typical orbital tube weld. Note the overlapping, pulsed-arc finish to the weld surface. Fitup is dependent on the weld-specification requirements on tube straightness, weld concavity, reinforcement, and drop through. If no specifications exists, the laws of physics require that the molten material flow and compensate for tube mismatch and any gap in the weld joint. Differences in tube diameter or out-of-roundness will cause weld-joint mismatch and arc-gap variations from one welding setup to another. The use of tube and pipe end-prepfacing equipment helps to ensure end squareness and flatness. The i.d. and o.d. should be burr-free with no chamfer. Ensure that no gap exists greater than 5 percent of the wall thickness. While the equipment can handle gaps of 10 percent of wall thickness, or greater in some instances, weld quality and repeatability will suffer. Check that the wall thickness and tube alignment varies in the weld zone by no more than plus or minus 5 percent of nominal. Again, the laws of physics will allow welding with mismatch of up to 25 percent of wall thickness, but, again, weld quality and repeatability will suffer. 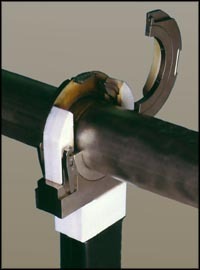 Avoid alignment mismatch by using engineering stands and clamps to align the two tubes to be welded. This setup also avoids requiring the weld head to force the tubes into alignment. Dufing welding, an inert gas directed to the tube o.d. and i.d. prevents the molten material from combining with oxygen in the ambient atmosphere. With sufficient shielding-gas coverage, welds can have zero tint at the weld zone i.d. Argon is the most commonly used shielding gas, for the o.d. and as the i.d. purge gas. Helium is often used for welding on copper alloys; mixed gases such as 98 Ar-2 H2, 95 Ar-5H2, 90Ar-10 H2, or 75 He-25 Ar find use on heavy wall tube, 0.1 inch and thicker. Using 95 Ar-5 H2 can cause hydrogen embrittlement in welds on carbon steels and some exotic alloys. As a general rule, for simplicity and to minimize shielding-gas costs, use 100 percent argon. Required gas purity is dictated by the application. For high-purity tasks such as welding of tubing used in semiconductor and pharmaceutical applications, where the concern for micro-contamination is paramount, engineers specify a ultra-high-purity gas or a gas with a local purifier to minimize or eliminate the heat tint. For non critical applications, commercial-grade argon suffices. The tungsten electrode, the source of the welding arc, is singularly the most important element of the welding system. While no one would refute the importance of the ignition device on an automobile airbag, the rip cord for a parachute, or quality tires for our automobiles, the importance of the tungsten electrode is often overlooked. Whether in manual or automatic welding, this is one area where metal fabricators can improve the consistency of their welding output with minor effort. By selecting the proper tungsten-electrode type and style, the engineer balances the benefits of a clean arc start and reduced arc wander with good weld penetration and satisfactory electrode life. 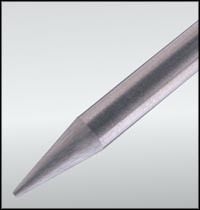 To produce consistent, high-quality welds, the tungsten electrode must be of high-quality material; tip dimensions must be held to close tolerances; and the surface finish--ground or polished--of the electrode must be consistent. Electrode Materials: For a long time, tungsten manufacturers have added an oxide to pure tungsten to improve the arc-starting characteristics and the longevity of pure tungsten electrodes. For orbital welding, the most commonly used electrode materials are 2-percent thoriated tungsten and 2-percent ceriated tungsten. Safety: Many users of the gtaw process do not realize that thorium is a radioactive element—grinding of thoriated-tungsten electrodes generates a radioactive dust. Cerium, as a base material, has lower work function than thorium, thus it offers superior emission characteristics, improving arc-starting ability without the threat of radioactivity. Electrode taper is usually called out in degrees of included angle, usually anywhere between 14 and 60 degrees. Grinding an electrode to a point aids arc starting when depositing short-duration welds on small parts. However, in most cases a flat spot or tip diameter at the end of electrode works best. Tungsten-electrode grinders are now available that provide all of the necessary features for precision grinding at a starting cost of less than $750.00. Pre-ground electrodes are also available so that fabricators can avoid electrode-radioactivity issues and ensure consistent, repeatable electrode material and tip geometry. Arc Length Arc-gap setting depends on weld current, arc stability, and tube concentricity or ovality. The welding engineer must keep the electrode at a constant distance from the tube surface with sufficient gap to avoid stubbing out. As a rule of thumb, set a base arc gap of 0.010 inch and add to this half the tube-wall thickness (or required penetration) expressed in thousandths of an inch. Thus, if the tube wall is 0.030 inch thick, then a good starting arc gap would be 0.010 + 0.015 = .025 inch. Weld Speed Weld speed depends on flow rate of material to be welded and wall thickness. The objective: to weld as fast as possible while still producing a high-quality weld. As a starting point, set welding speed at 4 to 10 in./min, running faster on thinner-wall materials and slower on heavy-wall tube. Welding Current Welding current depends on the base material, wall thickness, weld speed, and shielding gas. The objective: to achieve full penetration defect-free welds. As a starting point, for welding of stainless steel use 1 A of weld current for every 0.001 inch of wall thickness. Thus, for 0.030-inch-wall tubing, set average weld current to 30 A.
Weld Current Levels Orbital welding typically calls for multiple levels of weld current to compensate for heat buildup in the tube during welding. If the current used to initially penetrate the tubing was held at the same level for the complete weld, penetration would increase as the weld progressed around the tube, resulting in excessive penetration. To pulse the welding arc, the welding power supply rapidly alternates weld current from a high peak current to a low background current. This creates a seam of overlapping welds. This technique reduces overall heat input to the base material and can also allow for increases in travel speed. During orbital welding, arc pulsing offers another advantage, due to the fact that gravity pulls the weld puddle in different directions as the weld forms around the tube. When pulsing at peak current, the base material melts and flows together. At the lower background current, the puddle can solidify before becoming liquid at the next peak-current pulse. This diminishes the effect of gravity on the molten weld, minimizes weld sagging at the 12 and 6 o'clock positions, and helps prevent the molten weld puddle from running downhill at the 3 and 9 o'clock positions. Thus, arc pulsing becomes more advantageous as wall thickness increases. Establishing a procedure for pulsed arc welding requires the engineer to set four parameters: peak current, background current, pulse width (duty cycle), and pulse frequency. The ratio of peak current to background current typically varies from 2:1 to 5:1. As a good starting point, try a 3:1 ratio. Pulse frequency depends on the required weld overlap. As a good starting point, shoot for a 75 percent overlap. On thin-wall tube, set the pulse rate (in pulses per second) equal to the weld-travel speed (in in./min). In other words, if welding progresses at 5 in./min, pulse the weld current at 5 pulses/s. Pulse width, the portion of the weld cycle where weld current is at peak value, depends on base-material heat sensitivity and available current from the power supply. As material heat sensitivity rises, pulse width must drop. Standard pulse widths range from 20 to 50 percent; as a good starting point, set a pulse width of 35 percent. Food, dairy and beverage industries: These industries require consistent full-penetration welds on all weld jonts. For maximum piping-system efficiency, the tubing and tube welds must be as smooth as possible. Any pit, crevice, crack, or incomplete weld joint can trap the fluid flowing inside the tubing, becoming a harbor for bacteria. Pharmaceutical industry: Pharm-aceutical process lines and piping systems deliver high-quality water to their processes. This requires high-quality welds to ensure a source of water from the tubes uncontaminated by bacteria, rust, or other contaminant. Orbital welding ensures full-penetration welds with no overheating that could undermine the corrosion resistance of the final weld zone. Semiconductor industry: The semiconductor industry requires piping systems with exteremely smooth internal surface finish to prevent contaminant buildup on the tubing wall or weld joints. Once large enough, a build-up of particulate, moisture, or contaminant could release and ruin the batch process. Tube/pipe fittings, valves, and regulators: Hydraulic lines, liquid- and gas- delivery systems, and medical systems all require tubing with termination fittings. Orbital systems provide a means to ensure high productivity of welding and optimum weld quality. Productivity. An orbital-welding system will drastically outperform manual welders, often enabling the fabricator to cost-justify the equipment in a single job. Quality and Consistency. The quality and repeatability of welds created by an orbital-welding system, driven by the correct weld program, will be superior to that of manual welding. In applications such as semiconductor or pharmaceutical tube welding, orbital welding is the only means to achieve the required level of weld quality and consistency. Skill level. Certified welders are increasingly hard to find. With orbital-welding equipment you don't need a certified welding operator; all it takes is a skilled mechanic with some weld training. Orbital-welding equipment may be the only solution for applications where the fabricator can't rotate the tube or pipe for welding. It also finds use where access limits the physical size ofthe welding device. Orbital-weld heads, for example may be used within rows of boiler tubing, a difficult place for a manual welder to view the weld joints and apply his welding torch. Improved weld depth-to-width ratio. Arc pulsation can increase weld penetration while maintaining a minimal weld width. Alternatively, weld width can be reduced for the same weld penetration. Arc-puddle control. Improved control of arc-puddle convection minimizes porosity. The weld puddle freezes faster, minimizing or eliminating weld-puddle runoff during out-of-position welding. Arc stability--pulsing results in less arc wander or problems with weld-pool surface tension. Increased weld speed--development of a smaller or shorter weld pool allows for faster travel and improved arc stability. Improved weld quality, appearance, and consistency; reduced heat-affected zone; improved weld depth-to-width ratio; reduced dilution of dissimilar materials; control of arc-puddle convection; even distribution of any outgassed slag/contaminant; reduced porosity; faster solidification rates, resulting in a fine dentritic weld.